There were a lot of things that the Michigan fanbase told itself about this game, from the moment it was announced. Oh boy, another game with Florida, when we could have played LSU. Oh boy, a chance to get 11 wins in a meaningless game. Oh boy, several major players not playing due to injuries or draft concerns. There became a strange emotional disconnect toward this game. One where the general sense is "Well, I hope they win, but it's just such a come down from where we were before the Ohio State game." There was a moment when, on a second and nine, Christian Turner took a jet sweep up the sideline and looked like all of the promises of the various reports out of bowl practice, all of those tiny sips of hope that Michigan fans allowed themselves that maybe there had been lessons learned, futures unfolding...only to see where he stepped out inches short of a first down, followed by a pair of Ben Mason rushes that failed to get those last few inches, and the story of this game was already written, we just didn't know it yet. In every way, this tweet was right. Michigan folded after halftime, played with a lack of urgency on offense (almost 32 seconds per play when down three scores in the second half) and it brought out the worst in me. 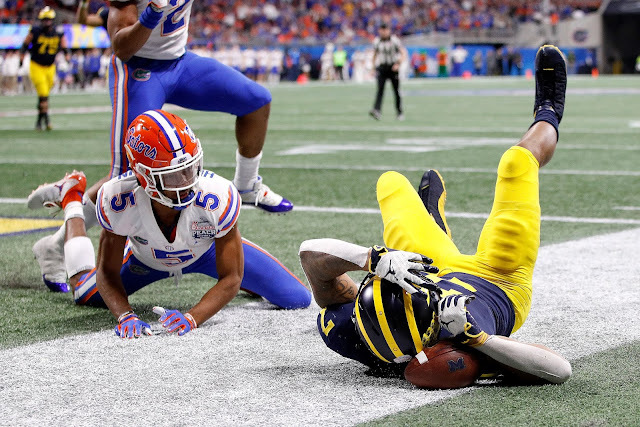 Down 27-13, having put Florida into a 3rd and 20 situation, Michigan's defense allowed Lamical Perine to run for 53 yards up the middle for a touchdown, sealing their fate. Was Michigan desperately missing Rashan Gary and Devin Bush and Karan Higdon? Yes. But they also had a month to figure out how to make this work. It doesn't mean it would be easy, but they should have had something more resembling a coherent plan, no? So what was Michigan this season? The team that won ten straight including beating Wisconsin, Michigan State, and Penn State, or the one that lost games to the Big Ten champion, a CFB playoff team, and a likely top-ten SEC team? It's both, and it's disappointing. People begged for Michigan to open up the offense and use the weapons of DPJ, Nico, and Black, and when it did, Shea was picked by a future NFL cornerback making a super heady play to get the pick. The breaks went against Michigan, but they also failed to make their own breaks. Every line of this that I write feels empty and hollow. There was a feeling that there would be more, by now, and there is not. I don't know if that is fair, but those are the expectations. It's just this realization that you almost feel stupid for caring deeply about things like this because disappointment is so much more inevitable than joy. But why am I surprised? I still have a vivid, picture perfect memory of walking through the lobby in Bursley my sophomore year, 1997-98, asking myself if this run was just setting us up for disappointment. And when it didn't, it was joy, but it was also a sense of relief. 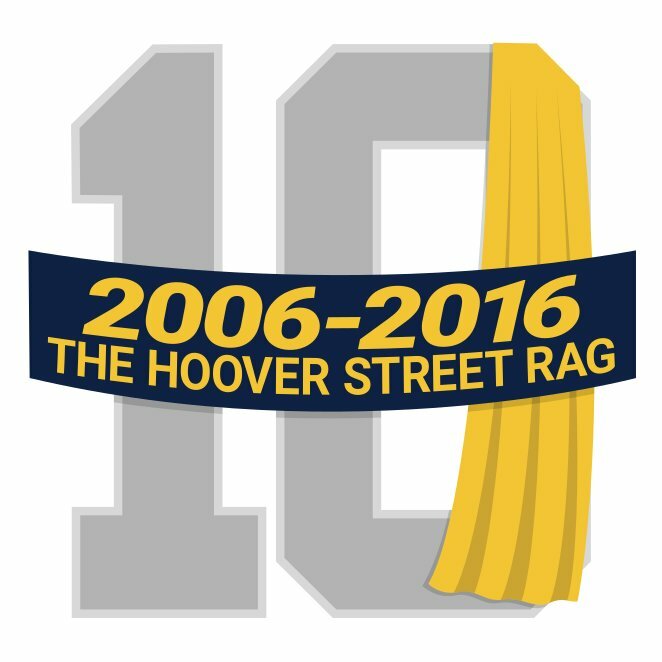 Michigan staved off disaster for this season, but we knew it couldn't be held back forever. For the past twenty years, Michigan football has been in a series of perpetual twilights, with the inky black of midnight coming sooner in some years and later in others. Part of this is because of the terrible run against Ohio State since 2003, meaning that a bowl loss would assure the fanbase of a two-game losing streak heading into the off-season. It is in that vein, I am reminded of something that noted college football fan F. Scott Fitzgerald wrote in The Crack-Up. "Now the standard cure for one who is sunk is to consider those in actual destitution or physical suffering—this is an all-weather beatitude for gloom in general and fairly salutary day-time advice for everyone. But at three o’clock in the morning, a forgotten package has the same tragic importance as a death sentence, and the cure doesn’t work—and in a real dark night of the soul it is always three o’clock in the morning, day after day." The seemingly ceaseless pitch black of the college off-season is about to settle in and it's not going to be dawn for a long, long time. See you in the morning.